Doug Ford’s government re-introduced a bill to reduce the number of wards in the city council from 47 to 25 despite a court order striking down an earlier version of the proposal. Ontario State premier Doug Ford is in the eye of a storm following his attempts to slash the number of wards in the Toronto city council. Opponents condemned the move as an attack on local democracy. Ford’s Conservative Party government introduced the Efficient Local Government Act 2018 in the Ontario Assembly on September 12 for the first reading despite opposition from the New Democratic Party (NDP) legislators, as well as protests from those in the gallery The protesters were subsequently detained. The bill proposes, among other things, reducing the number of seats in the city council from 47 to 25. The bill will amend or override the City of Toronto Act 2006, the Municipal Act 2001 and the Municipal Elections 1996 Act and awaits a second and third reading in the assembly in order to get the royal assent. Earlier, the first draft of the bill known as Bill 5, the Better Local Government Act 2018, was introduced (for the first reading) in the Assembly on July 30 and got the royal assent (approval after the third reading) on August 14. But it was challenged in the Ontario Superior Court on August 31 and was rejected by the court on September 10, which said it was in violation of the Charter of Rights and Freedom (which guarantees political and civil rights to those living in Canada). The court pointed out that as city council elections were due on October 22, and the election campaign was underway, it was highly unacceptable to make changes to the existing ward structure. In order to bypass the court’s ruling, Doug Ford invoked for the first time in Ontario’s history the ‘notwithstanding clause’ in section 33 of the Charter of Rights and Freedoms (which permits the parliament and provincial assemblies to pass laws overriding specific charter rights) and in order to re-introduce the bill in its current form. 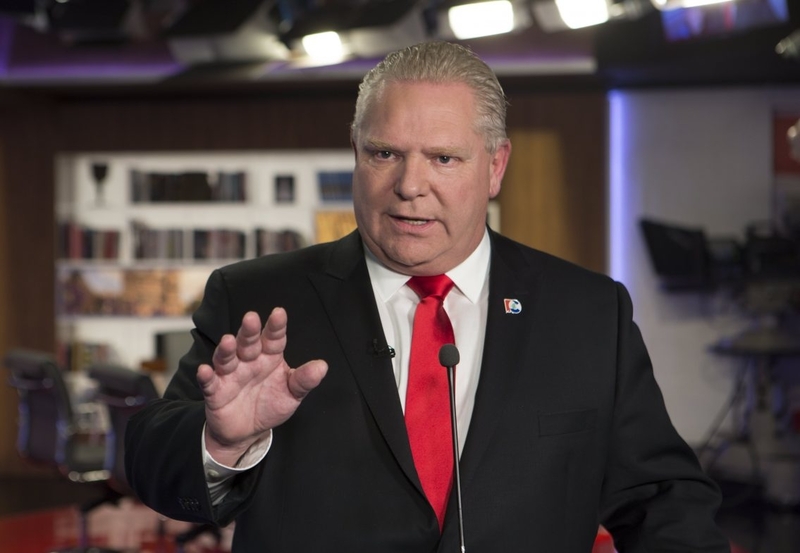 Doug Ford claimed that the bill was intended to save taxpayers’ money and was fulfilling his campaign promise of reducing the size of the government. However, throughout his election campaign, he had never once proposed reducing the size of the council. The opposition said that Ford’s decision to bypass the court’s ruling was political high handedness and was intended to take control of the Toronto city council through undemocratic means. There have been accusations that Ford was training his guns on his opponents in the city council, especially mayor John Tory, who defeated Ford in the 2014 city council elections. Later, Ford contested in the provincial elections in June 2018 and become the premier. Dave McKee, leader of the Communist Party of Canada (Ontario), in an article in People’s Voice, said that corporate interests were behind Ford’s attack on local democracy. He said that not only the city council of Toronto, but also the municipal administrations of adjacent towns like York, Peel, Muskoka and Niagara were targeted by Bill 5. These regions are part of the strategically important Greater Golden Horseshoe (GGH) region which is Canada’s most heavily urbanized region and the economic center of Ontario. McKee said Ford was acting as per the blueprint for making Ontario more open for business as dictated by the Ontario Chamber of Commerce. This blueprint was basically a corporate wish list and involved lesser government control, shifting the burden of taxation from corporates to citizens etc. It was for this reason that the proposal preferred technocratic local councils that would be open to corporate procurement of tenders and licenses rather than democratic local councils that often conduct social auditing, he added. Jagmeet Singh, leader of the social democratic NDP, tweeted that the court verdict of September 10 underlined the severely undemocratic nature of Ford’s Bill 5. The Ontario wing of the Liberal Party has launched a Save Local Democracy campaign on social media, demanding that Ford respect local democracy. ‘Progress Toronto’ a political group in the city, said that Ford had to either postpone any plans for altering the ward structure in the city council till the elections get over or quash such plans permanently. A Day Of Victory For the Algerian People: No Fifth Term For President Bouteflika! Today, the president of Algeria Abdelaziz Bouteflika renounced his plans to stand for the upcoming presidential elections. Italy is going through an unprecedented period of right-wing surge and hyper nationalist political charades.